This topic was published by DevynCJohnson and viewed 1797 times since " July 28, 2015 @ 06:00UTC ". The last page revision was " March 25, 2016 @ 16:47EDT ". On Linux, Cairo Clock is a very popular clock that many users love. 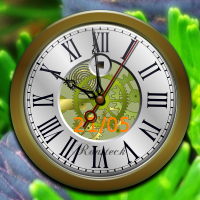 Numerous developers have made a variety of looks for this clock called themes or skins. This article will provide information on making, downloading, installing, activating, deleting, and sharing Cairo Clock themes. The best way to make a new theme is to copy the folder (/usr/share/cairo-clock/themes/default) to the location that you wish to work. This is the default skin that also makes great use as a template. The SVG files can be opened in any SVG editor of choice. Some users, experienced in SVG, may want to edit this file in a text editor. Overall, the best application to use is Inkscape; numerous developers use Inkscape to make many of the Cairo Clock skins available on the Internet. When making skins, the image sizes should not be changed, and the type of content should not be changed. For example, the clock's second hand should be made in the file "clock-second-hand.svg", not in another file. Otherwise, when your new theme is installed and activated, the Cairo Clock will not function correctly. All of the SVG images should be one-hundred pixels by one-hundred pixels. The hour, minute, and second hands as well as the shadows for the hands should be made in the top-left corners of the images. The end of the hand that belongs in the center of the clock should be in the corner. The hand should move towards the right, but never down. For the SVG files that contain the body of the clock, put the center of the clock's body in the center of the image. Below is a list of the required file names. When designing a new theme, only your imagination is the limit. You could make traditional clocks or make a clock of every president's face. Once all of the SVG images have been designed to your liking, rename the folder that contains the SVG files to the name you wish for your theme. Now, you are ready to install your theme. Downloading Cairo Clock themes will also expand your skin collection. Many websites offer themes for download. One of them is http://gnome-look.org/index.php?xcontentmode=186&PHPSESSID=6. Once you have arrived at this website, look for a theme that you like. All of these themes are free and legal to download, so get as many as you wish. The Cairo Clock has no limit to the number of installed themes that it can handle. For this example, I will download "Wood" by Palko. Click the download button. Once the download is finished, unextract the downloaded file. After that, copy the folder (titled "wood") to /usr/share/cairo-clock/themes. Then, restart Cairo Clock and activate the theme. To install the new skin, copy the folder and place it in /usr/share/cairo-clock/themes. Remember, root privileges are needed to place folders and files in here. Next, restart Cairo Clock because the theme list needs to be refreshed. The install process is complete. To use the new skin, right-click the clock and select "Properties". Next, pick the newly designed theme. To delete and unwanted skin, go to /usr/share/cairo-clock/themes and delete the folder that has the matching name of the undesired theme. If you want to distribute your Cairo Clock themes, then compress your theme's folder making it a tarballed Gzip. The file extension will look like this ".tar.gz". Unless you have a site you prefer most, http://gnome-look.org would be a great site to host your themes. You will need to register for an account to host skins on their website.